The ProX / Xstatic T-LS35C is a triangle crank truss system. 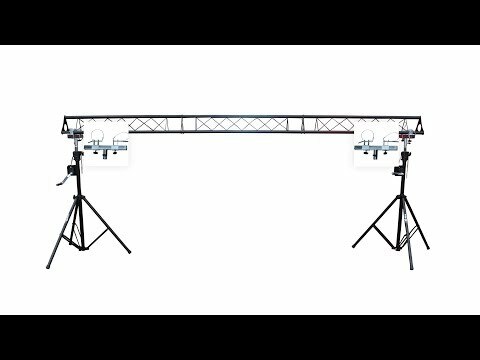 This medium duty truss lighting stand package includes two high-quality crank up stands & three 5FT triangle truss sections that create a 5ft, 10ft or 15ft span. The stand can safely reach 9-10Ft. A pair T-Adapters are included so you may easily mount your truss to the stands. You can mount up to 200 lbs evenly. truss pipes are 1.5" in diameter. Truss sections are 6 inches in overall width. Sold Separately: When purchasing a T-LS35C truss crank system. You will probably want the carry bags to haul your system around. These are high-quality bags, stitched with high-quality materials and will help you safely and securely transport your truss system around with ease. The carry bag T-LS35C-BAG is optional and is sold separately. To avoid problems a competent person should inspect all rigging hardware, stands and equipment before each use and periodically do a major inspection for signs of wear, abuse, and general adequacy, as well as perform any manufacturer recommended preventive maintenance on schedule. Observe all warnings and usage instructions in the full manual.